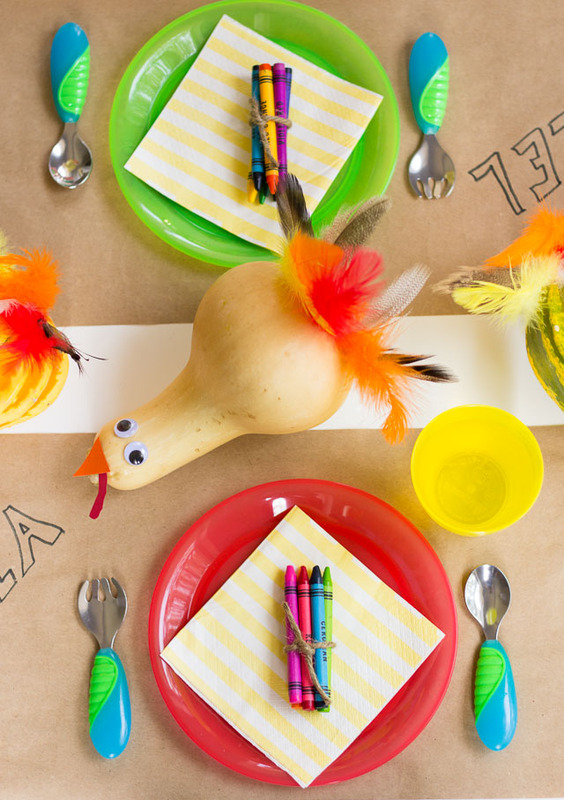 Growing up, being relegated to the kids table at Thanksgiving was not necessarily a thing to celebrate. But then again, I didn’t have a kids table like this! 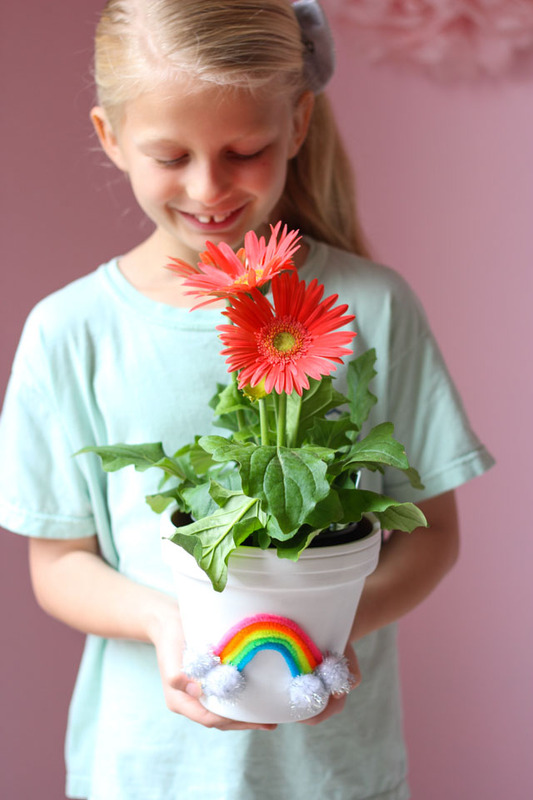 Today I’ve partnered with Munchkin, the makers of innovative products for kids, to give you a few simple ideas that will wow your youngest guests. 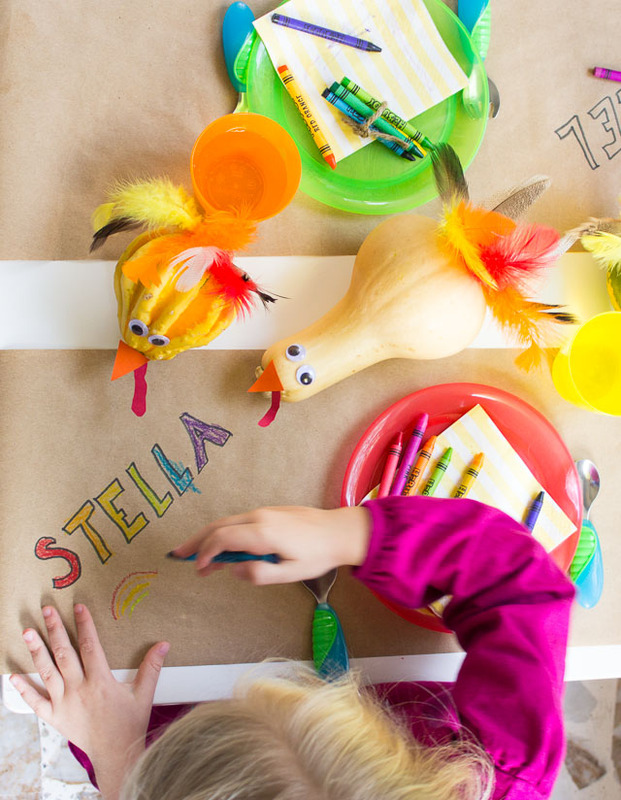 All of these can be pulled together Thanksgiving morning – you can even get the kids involved in the decorating! 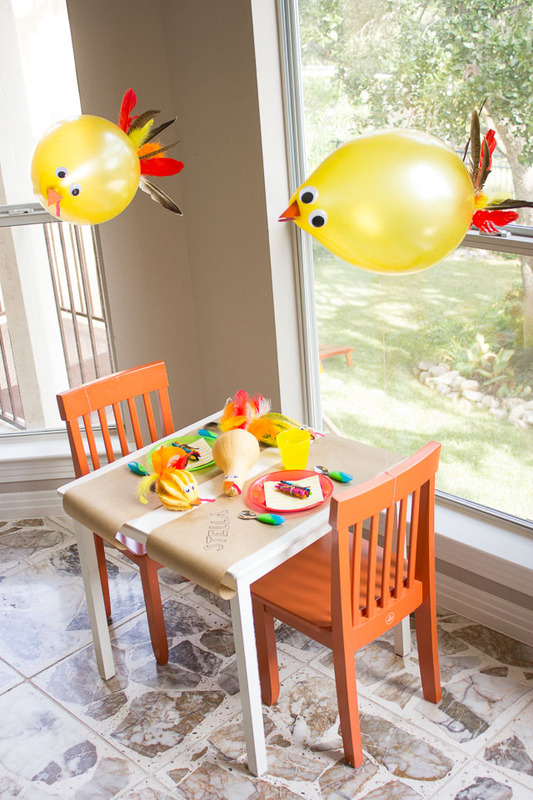 Turkeys are the star of this kids table with DIY turkey balloons at each seat and a few gourds turned silly turkeys as playful centerpieces. While kids don’t need to eat off the fancy china, they don’t have to eat off of paper plates either! 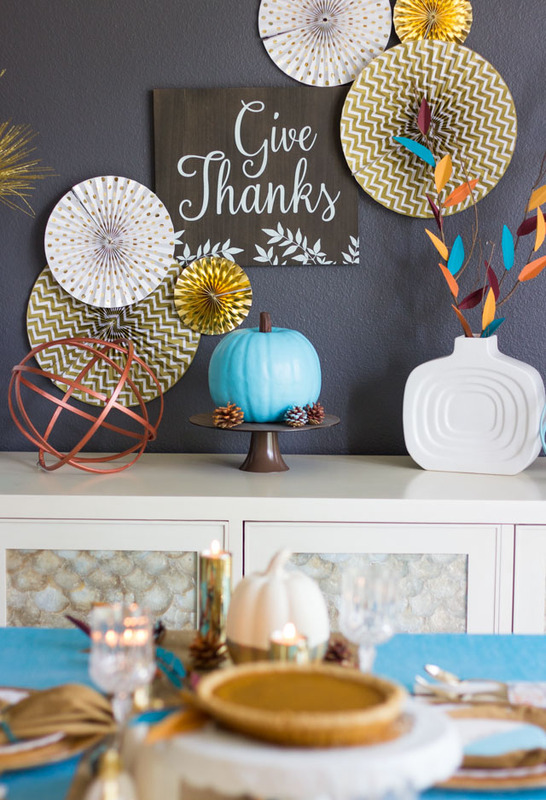 These colorful plates and cups from Munchkin are a great non-breakable option and just happen to come in the perfect Thanksgiving palette (you can buy a 5-pack for only $5). 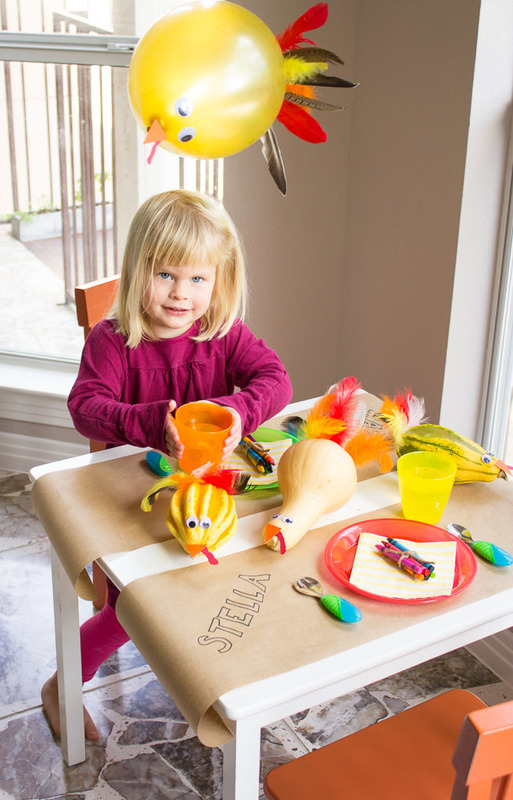 A roll of kraft paper makes for a kid-friendly alternative to a tablecloth. Just give the kids some crayons and let them get creative while they wait for their food. 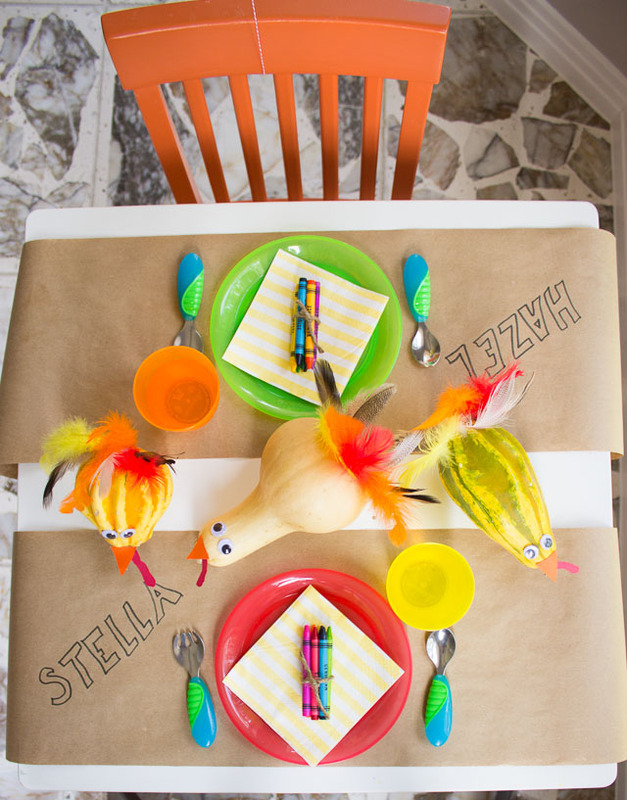 You can even have it do double duty as a place card by writing each child’s name by their spot at the table. 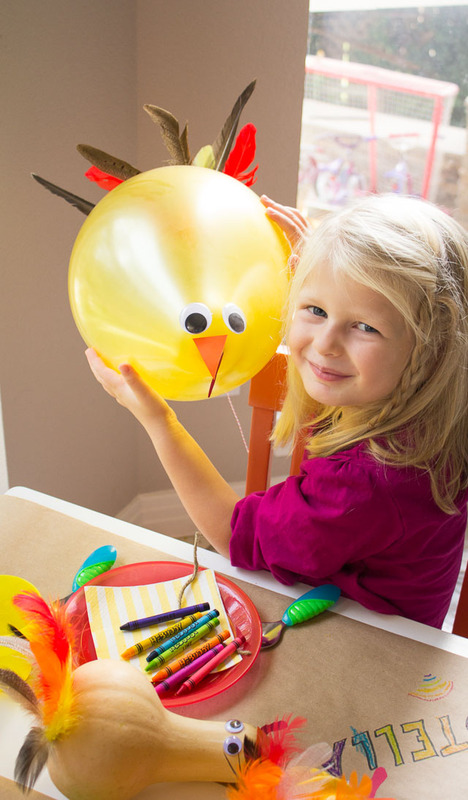 Any table decor with googly eyes is bound to be a hit with kids. You can also never go wrong with balloons. 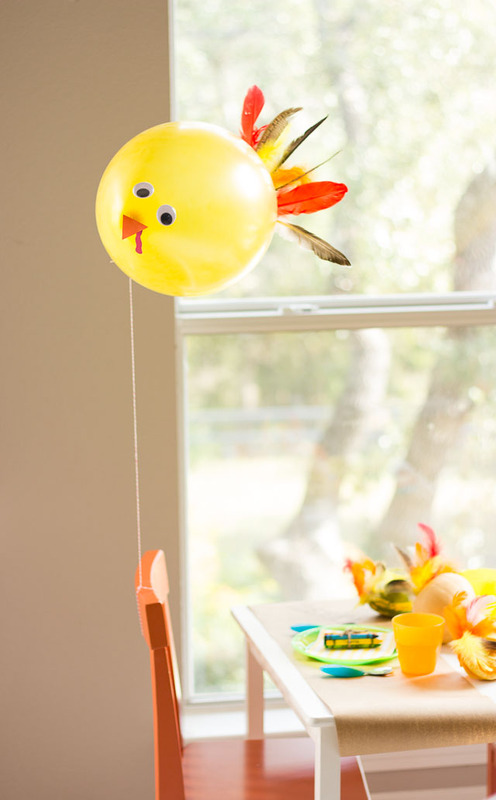 😉 Check out my simple turkey balloon tutorial. 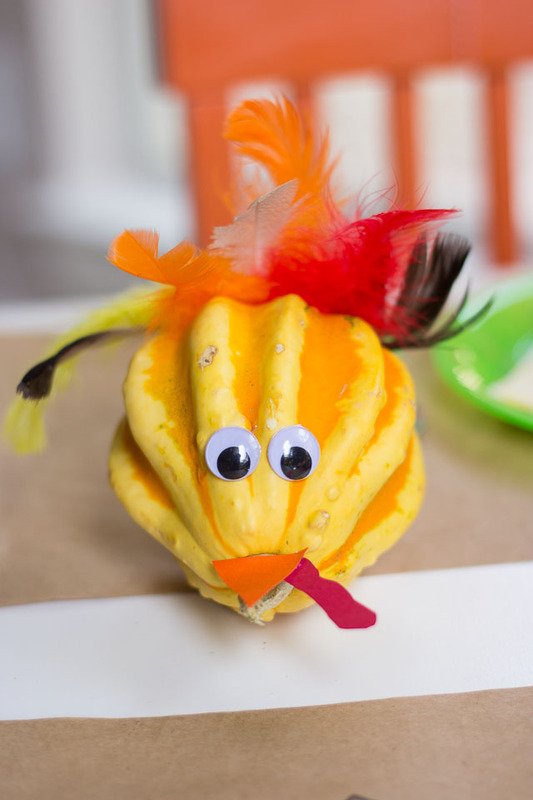 Read on to see how to make these gourd turkey centerpieces your kids will love! 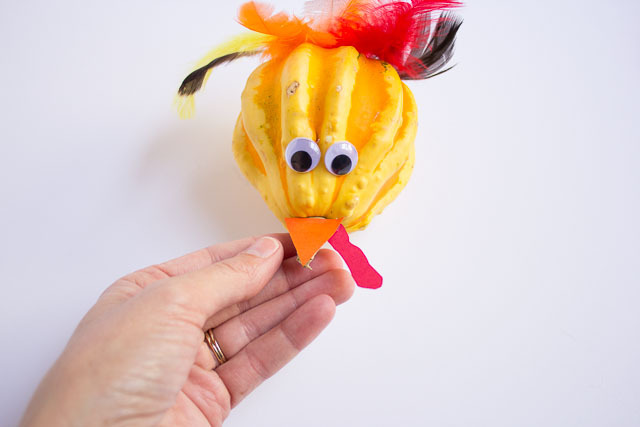 Small decorative gourds or butternut squash – looks for ones that resemble a turkey shape! 1. Lay your gourd down and determine which side should face up. 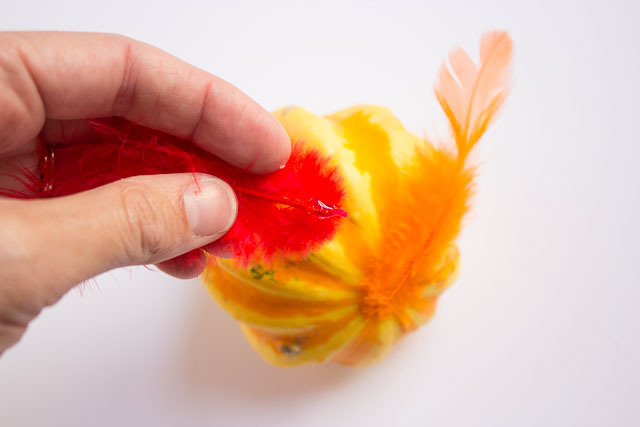 Add a small dab of hot glue (or craft glue) to the base of a feather and stick on the back side of the gourd. 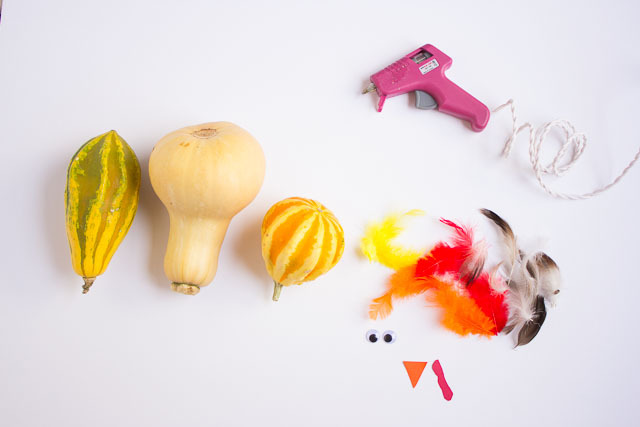 Continue adding feathers until you have a nice fluffy turkey! 2. 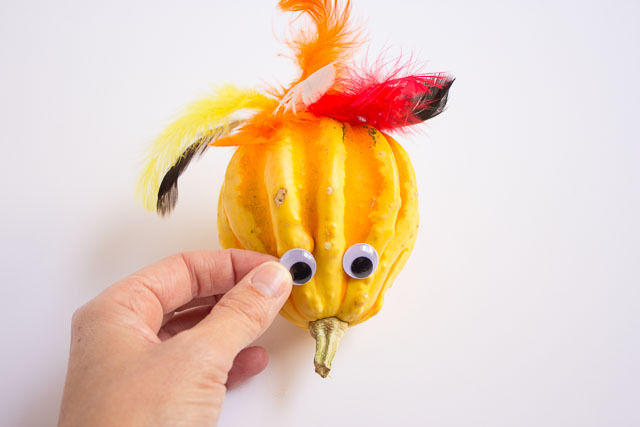 Add the goggly eyes to the front of the gourd with another dab of glue. 3. Finish with a little beak and waddle cut freehand from orange and red paper. I glued them on top of the gourd stem. You’ve got yourself one silly turkey. 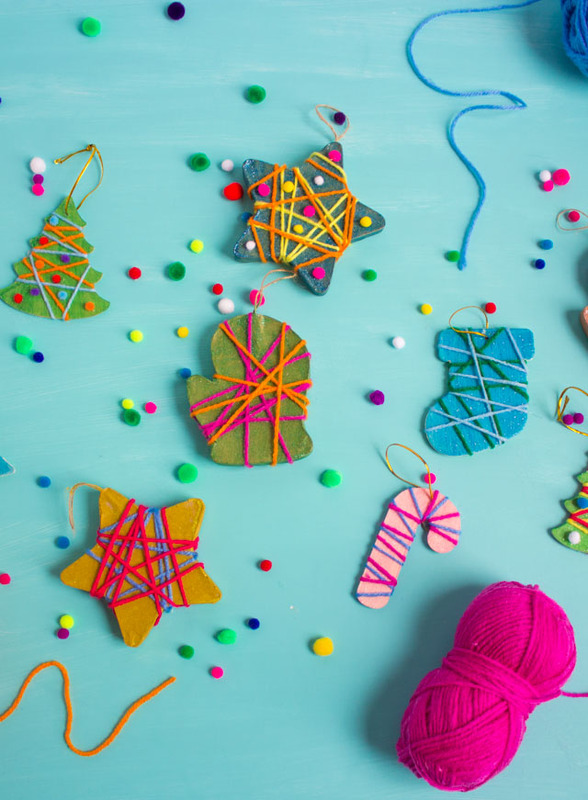 Repeat to make a whole table of them in minutes! 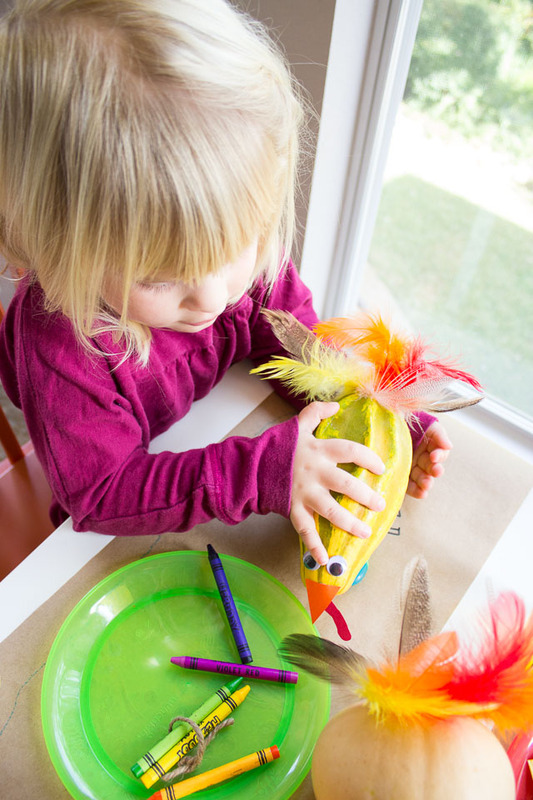 Now for some exciting news – I’m taking over Munchkin’s Instagram feed this weekend and will be posting more fun kids crafts ideas and shots from our weekend. This post is sponsored by Munchkin. Munchkin rids the world of the mundane by developing clever, innovative solutions that make family life safe, easier, and more fun. 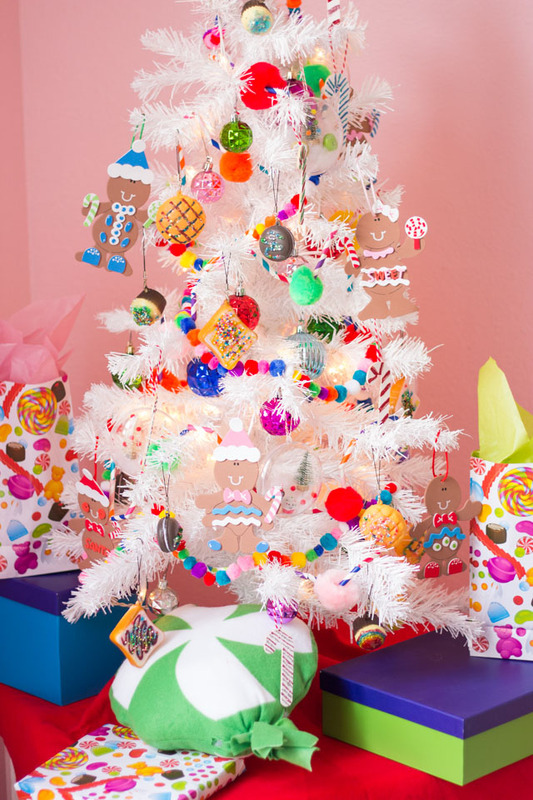 You can find their products at Munchkin.com, Target, Babies’R’Us, Walmart, and Amazon. It’s the little things!